Font support for rendering text in image files on some systems can be limited and you either end up drawing the characters yourself or you pay for a special font to be made where the glyphs for the range you are interested in are within reach of unmodified keys from the keyboard. Hold down [Alt] and press the decimal sequence, starting with a zero - in this way, [Alt] ends up as an 'em-dash' (''). So, suppose you need to be able to display Runes on your computer. The Unicode range for Runes is U+16a0 to U+16f0 and Notepad won't display this even if with the trick with the [Alt] key. Two fonts that do carry Runic characters amongst many, many more groups are 'Caslon' and 'FreeMono'. Unfortunately, these do not appear under Windows. However, if you are lucky enough to have, or know someone with a computer with a recent Linux on it (SUSE 10.2 will do), you can run a program called FontForge (You can use Cygwin to run this program but it is essentially built for UNIX-like OSes such as Linux, BSD (and Mac OS X), OpenVMS and so on). To copy a segment of font glyphs, start FontForge and then go to '/usr/share/fonts/truetype/' and select a font that has the 'Runes' range. Click on 'OK' and it will load. Go to the glyph number 0x16a0 and drag the mouse down to 0x16f0 thus highlighting the Runes range. Press [Ctrl][C] to copy them, then press [Ctrl][N] to bring up a new font workspace. Go to 0x0021 and press [Ctrl][V] to paste the set in the new font. You can edit/create any of the glyphs by double-clicking on them - you get the glyph editor and you can make the glyphs any shape you like (not entirely unlike the Softy Font Editor). Finally, click on 'Element', 'Font Info', 'General', set the 'Em' size to 1024 and click on 'OK'. Finally, click on 'File', 'Generate Fonts...', select 'TrueType' and click on 'Save'. Transfer this to your Windows machine and install it in the usual manner assuming that this is within the font's license or you have edited your own glyphs. The Unicode handling on Windows is not ideal and perhaps a little bit simplistic in some areas. Installing a font that has Runic glyphs in it (to use the above example) and then seeing what happens is quite enlightening. In Notepad (on the left) for example ('Format', 'Font'), you can select from Western, Japanese and Hebrew, right through to Thai and Symbol - a total of 10 groups - but no mention of Runic. In OOo with the same font (on the right), you get Basic Latin, right through to Specials. A total of 40 groups with Runic in at 15th. If you are going to use a particular font range and it is not included on Notepad (or whatever word processor/ text editor you are using) then either switch text editor or create a font with the symbols you want in the normal ASCII range. The automatic adjustment of the levels of the three primary colours so that casts can be removed has been around in one form for at least the last quarter of a century. Many people who take photographs don't know anything about colour temperature or artificial lighting adding casts to the final image and will quite happily use what is actually a daylight film (balanced for a continuous spectrum with a colour temperature of 5,500K - the middle 2/3rds of the day with sun and blue sky) in tungsten light (colour temperature 3,200K - Type L [as opposed to Type A which is balanced for a colour temperature of 3,400K and designed for use with photo lamps]). As a result of the lack of light in the higher energy end of the spectrum, the images all turn out orange. 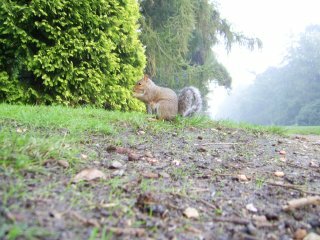 In colour enlargers, this can be largely corrected by altering the amount of colours so that the overall level ends up printing as a neutral, 18% grey. With the colour film having a far larger dynamic range than the 8 bits per pixel per colour images we get off cameras as JPEGs, you could make a better job of this than you would with such an image from a digital camera (excepting 16-bit-per-pixel-per-colour images such as RAW format images, of course). However, there is a distinct disadvantage to this and that is, if your image isn't supposed to be overall neutral, it is going to balance it all out in the wrong place. The rabbit above-right is grey and has come out grey. 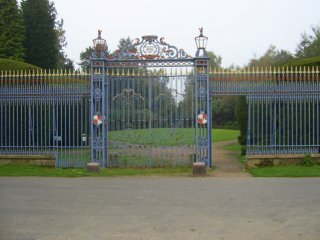 However, when the colour averaging technique modifies the levels of the three layers, you get something like the rabbit on the right - slightly magenta on a greyed out lawn. 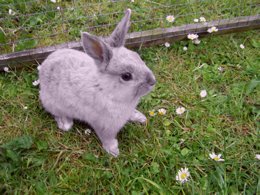 ...when you apply PaintShop Pro's 'Fade Correction', you get the image on the right. This is largely due to the fact that the synthetic image above has such a small dynamic range. There are real images that will do this using that tool. 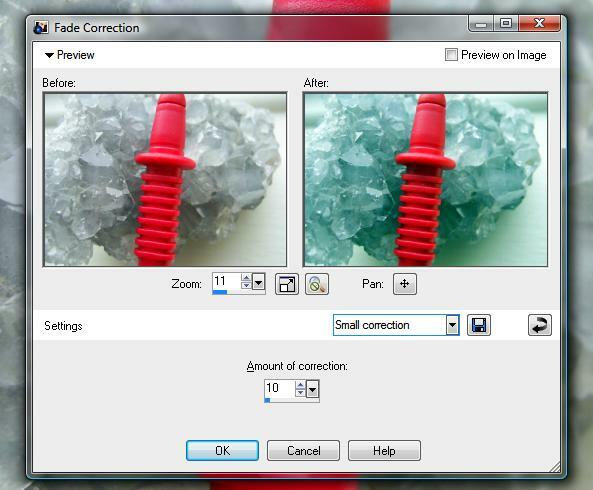 On the right, 'Fade Correction' is being applied to an image of smoky quartz with a multimeter lead in front of it (not that this is particularly likely, but it is a real image). You can see that the grey smoky quartz has taken on the complimentary colour of the red plastic. Clearly, this is not the right tool for the job. The solution to this is to correct it by hand. Levels allowing you to trim the top and bottom of the density range and define the gamma; and, Curves allowing you to do a lot more if you need it. Each of these controls allows you to change the image overall or a colour channel at a time. Other image processors also have these two controls and you can see the histogram either in Log or linear scale behind them so that you know which tones already exist. MP3 players are all right as long as you know what is happening when something seems to have gone wrong. If you have been using one ripping program and have then either switched to another or have played around with the settings, you might find that your MP3 player has started playing funny tricks on you. Although all of your other MP3 tracks play in order, the newly ripped tracks don't. It's not random, they always play in the same order, just not the original sequence. And, this is what is wrong. This is a classic 8.3 DOS name problem. The file system in MP3 players is almost always a FAT file system of some sort. FAT stores names in the 8.3 format and then there is an extra file system reference for the human interface. The program that ripped your original MP3 files most likely used a file name format that went along the lines of 'track-number_song-title.mp3' producing, for example, '03_just-what-i-needed.mp3' and '04_drive.mp3'. Your new ripper (or old ripper's new settings) probably saves the 'artist' first. Your new files might look like 'david-bowie_01_future-legends.mp3' and 'david-bowie_02_diamond-dogs.mp3'. In the first case, the 8.3 names will be '03_jus~1.mp3' and '04_dri~1.mp3' and will play in order because the track number appears within the first six characters of the file name so the results of an alph-numeric sort preserve the order. However, in the second case, they all start with 'david-bo' so it depends upon the order they were transferred to your MP3 player. It might be that 'Diamond Dogs' was copied before 'Future Legend'. The MP3 player just sees them as 'david-~02.mp3' and 'david-~04.mp3' and plays them in that order, regardless of the fact that 'Future Legends' comes first in the long file names. You can see that with the track number first, the 8.3 numbers preserve the order. However, with the artist name first, the track number is no where to be seen and you can see in the 8.3 column of the table that the order could be anything. In the screenshot on the right, you can see that I created a number of files of sizes that show up with their size the same as the number in their name. These were then copied across to another directory. In the image on the right, the left hand form shows that they have kept their long file names correctly and using the operating system, anybody would think that there was nothing wrong. However, you can see in the right hand form that the same files in the same order (comparing their file sizes) have adopted file names in a different order - this happened when they were transferred over. For new tracks, the solution is to configure the ripping program to put the track number first. For those you already have, just rename the files, putting the track name first. However, if you have two network interfaces with one plugged into your LAN (which probably goes to the router via a firewall) but the second goes directly into your router you might well find that when you plug in the second lead, all of your network shares disappear from my network folder. Well, yes it should happen and you really shouldn't do anything to change it. If you have a wireless card on your machine, when you activate that, you should see the same thing happen. The reason is that Windows is keeping your LAN - with all of its shared resources - secure. If you were to change this behaviour, Windows would need to know how to handle two network cards with different firewall properties and routes (traffic is only permitted to start connections from one of the cards; only certain ports are open on the other; maybe the traffic on some ports has to be routed to a specific IP address on the LAN; and, so on.). It is safer for the average user not to have to think about this and for Windows not to give them the option. Opening a dual-homed machine with access to a LAN can allow unauthorised users access to resources if they compromise any program that has initiated a connection - web browser plug-in buffer overflows, plug-ins with vulnerabilities and so on. So, it is in your interests not to play around with this and remember that if you just unplug or disable your second connection (ie, take down the link), your shares will appear automatically again. You will find that motion blur normally equates to camera shake. However, there are ways of applying this effect so that it makes it look like motion blur and not camera shake. Supposing you need to have an object on your website to have motion blur and be transparent so that you can put it on any background. 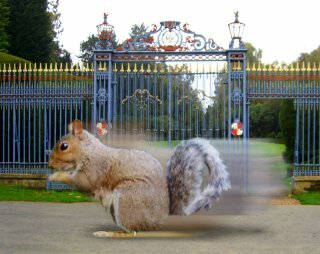 The motion blur effect will produce a linear blurring on either the whole image or a selection from it, depending upon how you use it - on more advanced image editors, you can use a zoom or radial blur in addition to a linear blur. If you want to use it to create the illusion of motion, you need to think about how this should be represented in your image. Normally, we imagine blur as the moving object with a trace of itself following its movement, with a stationary background. So, let's create that. First of all, straighten up your image then copy it to the clipboard (highlight all of it - normally this is done by pressing [Ctrl][A]) and paste it as a new image (so that we don't mess up the original). We need this so that we can scale the moving object so that it looks okay. Next, select your moving object (this should be lit similarly to the background so that it looks as though it could be in the same picture [good old British weather giving us overcast days so that the lighting is flat]), straighten it up and cut it out - pasting it into a new image will do. Now, put the moving object image into the background as a new layer but do it twice. The upper image is going to be our sharp object and the image below it is going to be our blur. If your moving object has highlights on it, you might want to make a third image that has just the highlights on it (use a threshold function to isolate them and then paste that as a new image) and put that over the sharp object ready to be blurred to the same extent as the other layer. Now, you can scale the background or the other objects so that they look as though they are in the background image. Next, you need to blur the moving object (and its highlight layer if it has one) so select that layer and blur it by selecting motion blur and then play around with the strength and angle until you have what you want. After doing this, you can add a transparent layer and add a shadow to it if you want to. 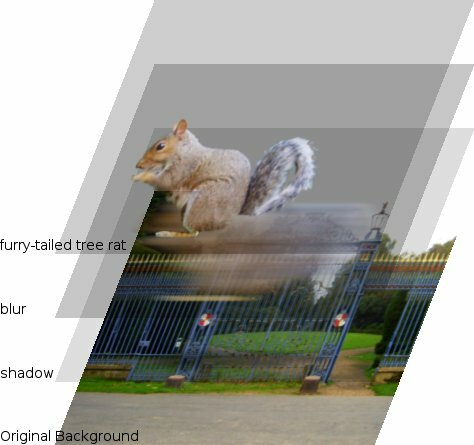 Next, change the transparency of the blurred layer and the top object layer until you have the effect you want whether that is a rocket powered squirrel or a dialogue box in motion. If you want to produce two images - one of the background and one of the foreground - turn off the background layer then merge all of the visible layers. Copy the layer with your foreground in it to a new image and save that as a .PNG image. Next, undo the merge process, turn off the foreground layers and turn on the background. Flatten the image and save that as a .PNG image as well. If you just want one image, simply flatten it and save the image as a PNG and that is it. Note that Internet Explorer has caught up with all of the other browsers and now supports intermediate levels of transparency. 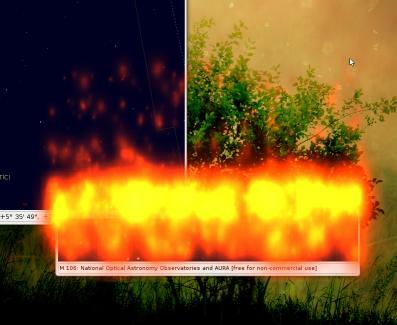 Click on the image on the right to open up a web page with a small demonstration of one way of putting two images together so that it looks like the one on the right. If you want to look at the code or the images, click here to open up a browser in a new window. It is quite easy to forget your admin account password and, if you have done everything correctly (apart from remembering the password that is) it is the only account that has any privileges. You might hear people telling you that all you have to do is boot up into KNOPPIX and delete the password file but deleting a file on an NTFS partition involves writing to it. Microsoft have failed to make NTFS an open standard so nobody outside of Redmond really knows how to write to it 100 per cent safely. However, it is safe to read from it. There is a bootable CD ISO that you can download called 'Ophcrack' from Objectif Sécurité (ophcrack.sourceforge.net). Burn a copy to a CD, load it into the computer in question and boot it up - it is a cut-down version of SLAX so it won't write to any disc. Ophcrack will load automatically, locate the password files and start work. Note that this is also compatible with Windows Vista password files. Ophcrack starts off with the LanManager hashes, using various strategies, covering around 99.95 per cent of all alphanumeric passwords (80,603,140,212) but because of a design error in the way that LanManager works with passwords - it's case-insensitive and creates two hashes from passwords longer than 7 characters - these 158,967,304,308 hashes are equivalent to 6,496,866,212,035,331,404,944 passwords of length 1..14 (but only using upper case letters - if you had lowercase letters as well, they are equivalent to 12,605,077,130,307,650,304,141,546 passwords). The LanManager passwords are the two hashes of the first 7 characters and the last 7 (depending upon the length of course). So if you had the password 'PinKyPerKy', you would end up with two password hashes, based on 'PINKYPE' and 'RKY'. You would also get the same LanManager password hashes if you used 'pinkyperky' or 'pInKyPeRkY' and so on. So, all you have to do is store the hashes for 1 to 7 character passwords, but only of one case for the letters of the alphabet. Once you have the results from the hashes for the LanManager passwords, (in our example, it would be 'PINKYPE' and 'RKY', we just have to do a binary case adjustment until we get the same password for the NT password (which is case sensitive). Their is a saying that 'if you lose your keys at night, only look under the lap posts'. 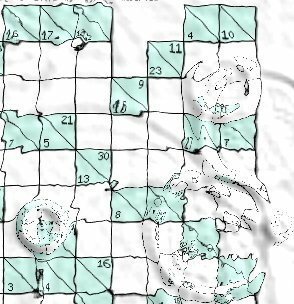 It effectively says look in the places you are most likely to find something - saving the more difficult places until last. Recovering your lost password is a little like this. People are unlikely to choose 'Y2,d94PsD2', they are more likely to choose 'j3nny6' or 'Yell0wD0g'. Taking into account the fact that many people only use letters of the alphabet in their passwords, they are the tables used first when trying to recover the passwords. Next, people will tend to add numbers to the letters. Sometimes, they will substitute letters for numbers so an 's' becomes a '5' and a 'b' becomes a '6' and so on. Some password recovery programs look for this as a separate exercise although ophcrack doesn't. Finally, hashes created using all alphanumeric and punctuation characters are compared. Some systems will not have the LanManager passwords turned on and so the only place left to try is the NT Passwords. These not only have the numbers, punctuation characters and uppercase letters in, they also have lower case letters. You can download this file and use ophcrack to break them. Of course, this tool - like every security tool - is a double edged sword and can be used to crack people's passwords in a dishonest fashion. By looking at the way it is done for an honest scenario (I have used it to recover the admin password from a friend's laptop), you can see how to make your passwords more secure (don't allow the LanManager to store hashes; use long passwords; use alphanumeric, upper and lowercase, punctuation characters). However, by making it more difficult for the dishonest user, you are making it more difficult for yourself when you need it. The best way of keeping your passwords safe is to keep the machine physically safe and to make sure that any server on it is well patched and configured in a secure manner. Ophcrack is reasonably quick - it is based upon a time/memory trade-off using rainbow tables which is a new variant of Hellman's but with better performance - the example in the screenshot above taking around 15 minutes. Now knowing the password, there is no need to write anything to the disc and you have avoided having to explain to other users why their accounts don't have a password any more. If the LanManager passwords haven't been enabled, you will need to download the full NT hash database file. Floppy diskettes have their place and, contrary to what some people might think, they are current. However, because many people first encountered floppies on machines using MSDOS or Windows, they think that they have to be formatted using a FAT file system (after all, flash drives all come formatted with FAT so why should the floppy be any different?). So, how do you manage to preserve the file permissions on a floppy diskette? To save such information on a FAT-formatted diskette, you would need to use a file of some sort to save the information - there would be no way of protecting it. However, FAT is not the only file system you can use on a floppy disk. In the screenshot, you can see a floppy that has been formatted with Minix - OpenSUSE's YaST allows you to format floppies in Ext2, Fat and Minix. You can see that instead of inheriting the UID, GID and permissions of the user that mounted the diskette (often '-rwxr--r--') or are described in /etc/fstab, as would have happened with FAT, when Minix or Ext2 is used, permissions are preserved. Just for the morbidly curious, you wouldn't really want to use '-rwxrwSrwt' as the permissions on a midi file - this is just to demonstrate that user, group and permissions are preserved. By having such as short release cycle when compared to some other OSes, the free world of UNIX windows managers can listen to users and develop features very quickly. Here, we have the Beryl window manager (forked from compiz) which has features that range from very useful to utterly frivolous but who is to say which camp any one falls into? 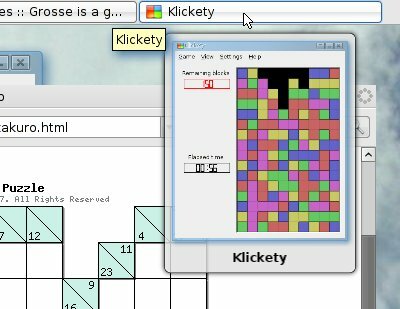 Now that Microsoft Windows Vista has caught up with other OSes by having its [Alt][Tab] list form as a large row of images, depicting what each particular window looks like, we can all enjoy the same. On Vista, you can also get an additional view of the images all in line (like a queue) by pressing [Win][Tab], effectively using the Windows key like a modifier (in the same way that [Tab], [Shift], [Ctrl] and [Alt] are). Here, you can see a number of windows queued up, ready for one of them to be selected. However, you can do the same thing with a UNIX desktop. One thing that you don't have though is a [Flag] modifier key. You do have a [Super] key though and on a Windows keyboard, it is the one with the Windows flag on it. If you have a Linux keyboard, it will most likely have a penguin on it (and, I dare say that if the keyboard manufacturers got enough requests from various other OS users, you could eventually find keyboards with the BSD devil, the OpenBSD Blow Fish and so on). In the Beryl keyboard shortcuts and elsewhere in the UNIX desktop windows, you will see 'Super' as a modifier key and on the right, you can see which one it is. Here is what you get if you press it with the [Tab] key using Beryl. Instead of a queue, you get them going around in a circle. Whilst all of this is going on, you can see that any windows that have live content will still continue to have this content updated. Beryl and Compiz aren't about copying Windows or Mac OS X though. If you look at what is available on them, you might thing that they are about pushing Windows and OS X firmly into third place and whether they are or not, that is what they do. For a start, you can, as has been the case for many years, have more than one desktop on a UNIX system and whilst people like me might have 10 or 12, most people find that four is a good optimum. 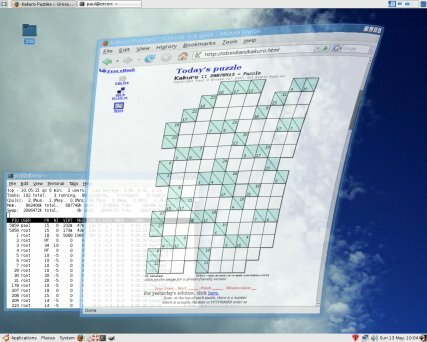 The Beryl GUI is based around a cube (usually) upon which you have four desktops. Each one is what you would normally see on a Windows or Mac OS X machine but here, you can space yourself out and improve your way of working. One of these is that if you have a cluttered desktop, move the mouse to (usually) the top-right corner and all of the windows on that desktop will spread themselves out, with any scaling and you can click on the one you want (or use the cursor keys and press enter). When you click on the window, it will merely select that window - the mouse click is not passed on to the window so it doesn't matter where on the window you click. all applications on all desktops. 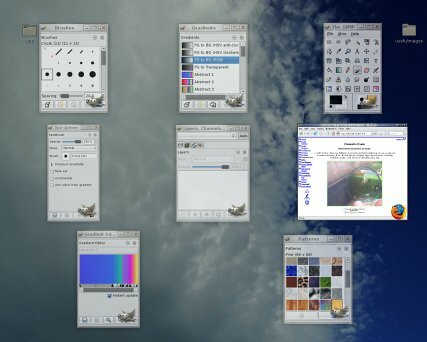 You can activate the corners and edges of the desktop, assigning functions to each so, you could, as an example, make the top-right corner display windows for the current application, the top edge for all windows on that desktop and the top-left corner for all applications on all desktops. If you want to change desktop, just hold [Ctrl][Alt] and drag it sideways with the mouse. 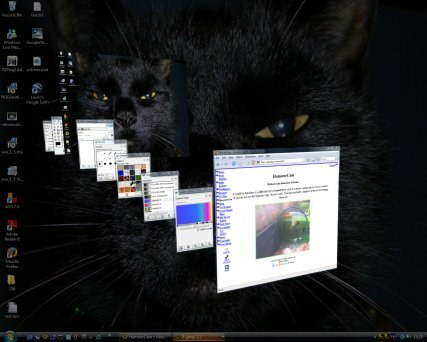 Whilst you are doing that, the desktops become partially transparent so you can see the other faces. Note that in the screenshot below, on the face at the back, you can see a web browser that is partially transparent and in front of that (if you were viewing it from its front) is an opaque browser window with a large picture at the bottom. From that desktop's front, the transparent window is hidden by the opaque one but because we are looking at it from behind (all of the writing is back to front), we can see through it to the opaque window. Also, note that windows are displaced by different amounts from the desktop so that when one window is covering another, it is moved so that it is in front of it. 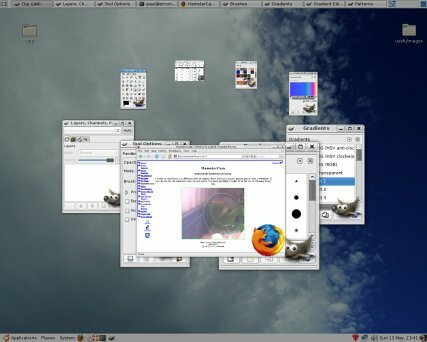 You can change the transparency of individual windows by holding down [Alt] and scrolling the mouse although you can configure any buttons to do these actions. Also, when you drag a window, it wobbles like a piece of jelly and when you drop it in place, a ripple propagates across the screen. This is a maximized window that is being dragged from the top right. The whole thing bends, allowing you to see what is underneath. If you hold down [Ctrl][Super], your mouse will create a ripple which you can move around like running your finger around a shallow bath. Pressing [Shift][F9] creates a rainstorm (on the right) and [Shift][F8] clears it away with a windscreen wiper (pressing those keys again turns them off). The settings for the rainstorm can be changed and so as to allow you to see the effect more easily, I have increased the depth (which enhances the effect). When it is set to its default, it is quite possible to work with it running (unless you are doing image processing of course). This is part of the shot above at normal size so that you can see what the effect is like. If you hover the mouse over the items in the task bar, you can also see what they look like, like so. Minimising, maximising, killing, restoring windows allow you to choose from rolling them up or beaming them up to setting fire to them and there are plenty of other effects to choose from. Some of these are genuinely useful such as the desktop switching and window picking whilst others, such as the window transitions and rain just have wow value. You have the flexibility to choose what you want. A single lens will focus light from a distant point - such as the sun - to a single point (as a child, we have all burned our names on pieces of paper using this). The lens works because light travels slower in glass than it does in air and by using curved surfaces, the light can be bent to focus on the paper. However, not all wavelengths of light are slowed down the same. If you look towards the edge of the image, you will find that areas of high contrast will produce rainbows because of this effect - called 'dispersion'. Not all transparent media are the same though. Some have higher dispersions than others and by using crown glass and flint glass with the convex lens being stronger than needed but using a concave lens to correct this, two wavelengths of light can be made to have the same focal length. These lenses are called 'acromatic'. Hence, using three glasses, you can focus three wavelengths - these lenses being called 'apochromatic'. With careful design, the three wavelengths can be made to coincide with the peak sensitivities of the three colours used in the camera's sensor. On the right, you can see how red green and blue have the same focal length. If you were using this technique for astronomical purposes, you might want to make the lower crossover point somewhere in the infrared. Another advantage is that they are designed to correct for spherical aberration at two wavelengths instead of just one so overall, the image is at least an order of magnitude better than those produced by acromatic lenses. If you have a hard drive with Linux already installed on it and want to install Windows Vista on a spare partition on that drive you might find that the DVD starts okay and you type in your registration number and so on but then it says; 'Windows is unable to find a system volume that meets its criteria for installation'. Note that this can happen after you have formatted a partition using the Windows Vista install program's partitioning section. Many people have been having problems with this: they have unplugged all of their drives except one; and, deleted all of their partitions, including any OSes that were already there such as Linux. However, the user ends up with a system with only Windows on it and only one partition, covering the whole drive. Where it says; 'Windows is unable to find a system volume that meets its criteria for installation', there is something that it is not telling you and, just as importantly, it is not giving you any means of correcting the situation. This critical point is that Windows needs to be installed on the only 'Active' partition on the system so that when the computer boots up, it looks there first. It's easy to see why the average user ends up with only Windows on their system. So, how do you get it to do what you want? Insert the CD and boot up the machine. Once KNOPPIX is running, you need to be root so click on the 'Konsole' icon at the bottom and then enter 'su'. Now, enter 'qtparted' and you will be able to see all of your drives. In the left pane, click on the drive you want to edit and you will then be able to see its partitions in the right-hand pane. In the listing, you can see which partition is active - this should be your other OS's partition so make a note of which one it is. Next, right-click on the Windows partition and in the menu, click on 'Set Active...' and select 'Yes' in the confirmation dialogue. Finally, in the main menu, under 'File', click on 'Commit'. If your system is a multi-hard-drive system, you need to go through the other drives to make sure that none of the other hard drives have active partitions on them as well. If, say, you intend to install Vista on your second hard drive and you already have an active partition on your first - where your primary OS is located - you will have to click on that drive (in the left pane), right-click on the active partition in the right pane (having made a note of which one it is, of course) and you will notice that the active partition entry in the menu has a check-box that is ticked. Click on that to uncheck it and then, in the main menu, under 'File', click on 'Commit'. Once it has finished, reboot the machine. The KNOPPIX CD will be ejected and at that time, insert the Windows Vista DVD. Install Windows as normal, selecting your active partition and when you have finished, load up KNOPPIX and reset the active partition(s) to your original partition choices. Note that if you have Windows on another partition on another drive, Windows will have set it as active as well so that it can use the bootloader in that partition. 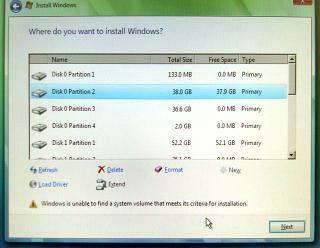 You need to check these other partitions out before you know your systems is the way it was. All you need to do after that is edit the Grub menu file to include Windows. Microsoft have failed to make Vista Multi-Boot-Specification-compliant. However, dual-booting into Vista isn't that difficult when you know what to do. You've changed the active partition to an NTFS partition, installed Windows Vista and changed the active partition back to what it was. Now, all you need to do is configure your bootloader so that it runs Vista. For the reason that Windows does not comply to the Multi-Boot Specification, you will need to chainload it from Grub (although you might argue that that makes it easier because if Windows changes, you don't need to go changing your /boot/grub/menu.lst file). ...assuming that it is on the second partition of the first hard drive. Save the file and when you next boot up, you will get your Vista line included in the choices for an OS to load. Many people have PassWorDs and UserIDs for many websites and, of course, they all need to be different. However, one solution - and not a very secure one - is to use your own Single Sign-On (SSO) system where, effectively, you have one UID and PWD for use on all of the sites. This might sound convenient - you only have to remember two strings - but if they should become compromised, you will have awarded somebody access to all of those sites. It is clearly better to use a different UID and PWD for each site but then, you get the problem of having too much to remember and the usual way of solving that is to write the UID/PWD combinations down on a piece of paper. It is far better to store them electronically and securely if you can. The Aladdin eToken - a small USB token (above-right) - with Web Sign-On will do what we want here. There are two pieces of software to download and install: a Public Key Infrastructure (PKI) client program and the driver (XP and 32-bit Vista - it wouldn't work on 64-bit Vista). With the software installed, you plug it in, load up Internet Explorer and right-click on the toolbar. In the menu that appears, click on 'Web Sign On' which makes it appear as another toolbar. Next, browse to a password protected site and the eToken WSO window will appear over the normal authentication window. Enter your UID and PWD for that site/realm and click on 'Process' and then, when the 'Save Profile' form appears, click on 'OK'. Next, if this is the first time you have used the eToken in the session, you will have to type in your eToken password. Click on 'OK' and it is saved, the authentication form filled in and you are logged into the site. Now that you are logged into your eToken, it will automatically log you into any site that it knows about. You will need the driver loading onto each machine you use but all you need to do is take the eToken around with you - the UIDs and passwords are not remembered on any of the machines and as you have never typed them, a keylogger won't be able to pick them up.